As the refinement of the Swampscott dory type reached its zenith, the need arose to depart more distinctly from the workboat origins — where rowing was as important as sailing — and to develop a dory type specifically for sailing in interclub races. And, as John Alden never failed to appreciate the trends of his time, he set Sam Crocker, then in his employ, to work on a sailing dory one-design class in early 1921. The result was a beautifully modeled 21-footer with a marconi rig that carried 350 pounds of inside ballast. The advantages of the new design over the traditional Swampscott were greater beam and firmer bilges, brought aft to the transom, which afforded the opportunity to carry more sail and thus perform better (on a triangular course). With its generous side decks and inside ballast, the design provided a margin of safety without diminishing the excitement factor. It was, in (act, a boat well suited to clubs with limited budgets and many young sailors. William Chamberlain built the first boats (and many of the rest), which were first sailed in 1921 at Marblehead's Eastern Yacht Club. So successful were the boats that other clubs ordered more built, and the Indian class was well on its way. In an age of high-performance planing craft, the Indian class has little to offer today's racing sailor, but before it vanishes into obscurity, we ought to take another look. It is, after all, a fine performer itself, and one that will sail well in all sorts of conditions. Given its relative simplicity of construction, the Indian should be relatively inexpensive to build. The Indian is built dory-style, with the bottom, stem, transom, and six sawn frames being set up first. After the planking is completed, four pairs of steam-bent frames are set in place between each pair of sawn frames, the combination providing a light, stiff hull. Because of that construction, full lofting is unnecessary and dimensions can be picked up from the plan. An interesting option offered in the design is the so-called V-stern, wherein the garboard and broadstrake lap together at the transom without a knuckle, affording, presumably, somewhat less drag at this point. The round-sided dory types require a wider-than-usual garboard, the stock for which can be very difficult to find these days. There are, of course, a number of ways of creating one wide plank from two narrow ones, but the cheapest and simplest solution might be to join them with typical riveted dory laps, perhaps made flush so as not to show. For the best guidance on dory history and construction, John Gardner's The Dory Book (Mystic Seaport Museum, Mystic Connecticut, 1987) is unmatched. 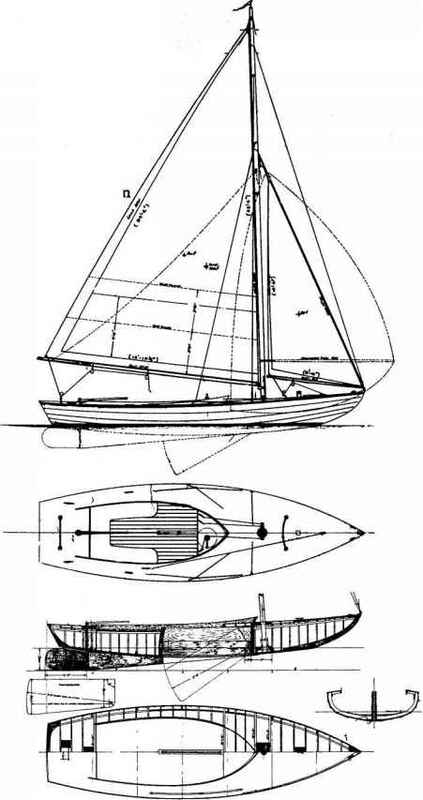 Plans of the 21-foot Indian Class are available from The WoodenBoat Store, P.O. Box 78, Brooklin, ME 04616; 800-273-744 7. Henry (Harry) Scheel is no longer with us, but what remains is a 50-year legacy of designs (and boats) that came from the drawing board of this most creative man. 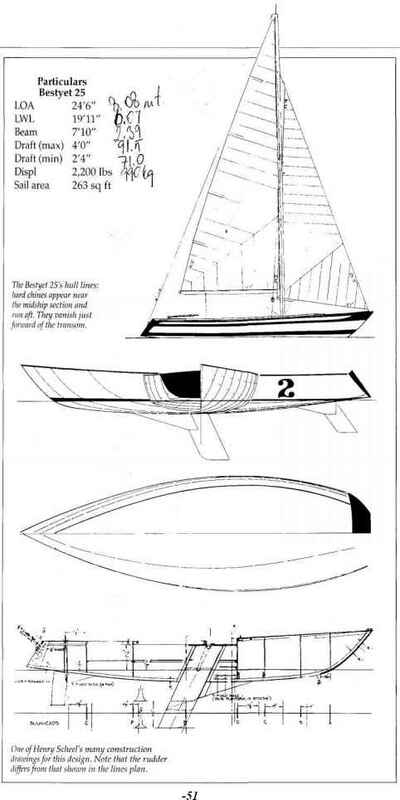 Scheel was an early hero of mine — his designs always stood out from the pages of the boating magazines over which I misspent so many youthful hours. His boats had a flair, a bold profile, a youthful zest, so much like the man I later came to know. His early career was based in New York City and Connecticut, but later years were spent here in Maine. Before he died, his design work had begun to reach international circles, and three large designs were built at the Royal Huisman Shipyard in Holland, necessitating many (rips abroad to oversee construction. To my eye, these arc among the loveliest of his creations. They represent the culmination of a lifetime of design. Always an innovator, at the time of his death he was working on a series of designs for a new hull shape (hat he believed would make a better, faster boat — one in which wave-making would be suppressed by the addition of a chine in the after sections of the boat. He pursued this idea with a series of sailing models, most of them radio-controlled, and it was a common •■ight around Rockport, Maine, to see Harry fooling a ith his models. He even made one that had the usual round-bottomed hull shape on the starboard side while ;he port side had the added chine. Sailing this model in first one tack, then the other, demonstrated to Scheel the value of the chine, and he was able to photograph the different wave patterns coming from each side. Several years ago, a 25-foot daysailer was built to this idea — the boat illustrated here. Scheel had named the new series Bestyet, and the boat in question was the Bestyet 25. A look at the Bestyet's plans will show that innovation did not stop with the added chine. The boat has a most interesting drop keel combined with a triangular fixed fin amidships. The sail plan shown is conventional, with a self-tending jib trimming to a track just forward of the mast, but Scheel was experimenting with more radical mainsail shapes — fully battened, and shaped much like windsurfer sails. The lines plan, especially the body plan, shows what Scheel was doing. A light-displacement shape with long, straight buttock lines and a nearly flat bottom has been modified by starting a chine near the midship section. The chine runs to the stern, where it dies out between the last station and the stern itself. The effect of this in the body plan is to widen the LWL in the after sections, to straighten the buttocks even more, and to produce a shape that will handle higher speeds without too much quarter-wave production. I suppose the idea of drawing the chine at the stern is to eliminate drag when the corner of the transom is immersed, and perhaps for looks. The only thing I find surprising about the lines is the large amount of forward overhang. I would have thought that in a boat of this type, Scheel would have gone for more waterline length and less overhang. But this overhang does make for nicely V'd forward sections and a drier boat. The boat is quite beamy for her length, but the sections have considerable flare in the topsides, and the waterline beam is moderate. The boat is light enough and small enough to gain some of her stability from the weight of her crew sitting to windward. With the lead drop keel down, and a couple of crew on the rail, her stability should be good enough to handle the large sail plan shown. The boat is built of cold-molded wood — a nice job by Steve Van Dam. This 25-footer has a light, multilayer veneer skin over a framework of bulkheads and longitudinal stringers, and a thin plywood deck covered by teak strips. This type of construction produces a stiff, strong boat with minimum weight, but it creates an interior that is very much cluttered up with structural pieces. Scheel elected not to have a cockpit in the strict sense of the word, drawing instead two footwells separated by a bridge deck for the main traveler, and letting the crew sit on the wide side decks. When I sailed the boat, I did not find this a very comfortable arrangement and, with four of us aboard, felt that we were unduly crowded in a 25-foot boat. But we must remember that the boat has very little depth of hull — she reminds me most of an overgrown Lightning — and to expect a deep, comfortable cockpit with seat backs is probably unreasonable. After all, what we are pursuing here is a new and faster way of sailing, not creature comforts. There is a hatch in the forward deck for access to the forepeak and for storing sails. On each side of the cockpit, a section of the side deck hinges up to allow stowage of smaller gear items. The drop keel trunk comes through the deck just forward of the cockpit, and there is a winch and two-part tackle arrangement for handling this heavy unit. The mast is stepped just forward of the trunk. When I sailed the boat the day gave us only light airs. The mainsail on board seemed to me to be about half size, reaching as it did only two-thirds of the way up the mast and halfway out the boom. These ho facts combined to make for a less than satisfactory chance to try the boat's potential abilities. I am used to day sailers with lots of lateral plane ami a good grip on the water. By comparison, the Bestyet's minimal keel area and small expanse of sail made h« very sluggish, and caused her to make a lot of leeway when beating out of the harbor. Outside the lighthouse we lay off on a longer reach, looking for more air, but never found it. The best sailing of the day came just as we returned to her mooring, when the wind picked up a bit and we zigzagged amongst the closely packed boats and she began to pick up her heels just a bit. I had the feeling that I had saddled up a racehorse that never quite got out of a trot, but might someday answa the trumpet with a charge that would take yourbreatfi away. What about the new and improved underwater shape, and the claims of better performance from it! Had there been 15 or 20 knots of wind that day, I might have an answer for that question. 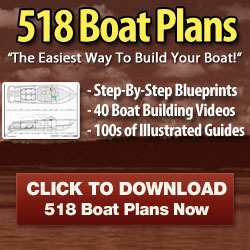 Having been an interested observer of boat design for more than half a century, I know how little comes along that is truly new and revolutionary. Design evolution is inevitably a series of very small steps forward, interspersed with backslides and side excursions. But Henry Scheel was always a man eager to take any trad that offered promise, and he was undiscouraged when left floundering in the puckerbrush. I suspect that with this boat he was on the threshold of one of those very small steps. Whether it will develop into a large gain remains to be seen. But, bless the man for stepping forward. Good sailing, Harry! The original drawings for the Bestyet 25 are now at Mystic Seaport Museum, Ships Plans Division, P.O. Bra 6000, Mystic, CT 06355.